You will be flying in an Icarus C42 3 axis microlight - one of the best! 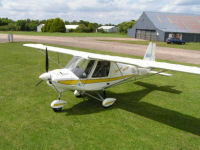 The fixed wing microlight is effectively a small conventional aircraft. The wing is fixed to the aircraft and has ailerons to control the roll and and elevator to control the pitch, the 3rd control being the rudder that controls the yaw, hence the term '3 axis'. These control surfaces are controlled by a control column (stick) and two rudder pedals requiring the coordination of the hands and feet. Don't worry, it's not as complicated as it sounds!